ARRA FERGUSON was a boy-soldier during the American Revolution. 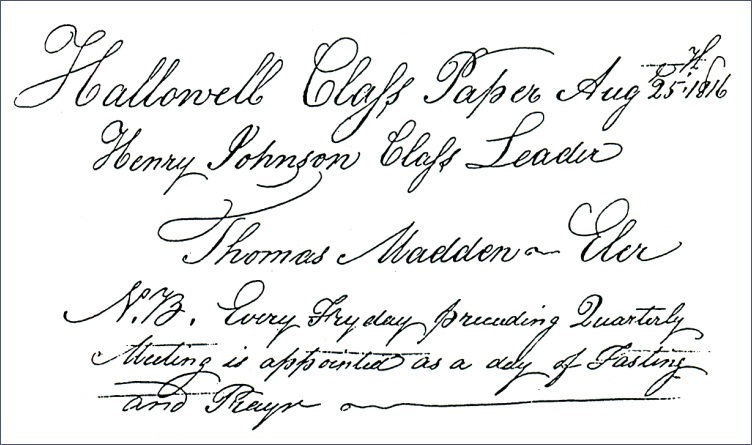 On that fact-and on his famous penmanship-hung much of the success of the rest of his life. As a Loyalist he received 300 acres by 1797, sold parts of it, bought and sold more land and worked as a clerk and conveyancer. By his own account, he was born 23 September 1769, probably in New York Province, “and bore arms in the old Revolutionary War as an UE Loyalist in the Kings Rangers under the command of Major James Rogers,” as a private, probably along with his father and brothers. When they were discharged after the War they were given land along the Bay of Quinte, west of Kingston. In an affidavit he states, “I first settled in the Township of Fredericksburgh Additional on lot no. 12, in 1 concession in the year 1784.” He was not yet 15, and likely lived with his family. While there were several Fergusons in the area, family relationships are not clear. Arra is shown in land records on the same Fredericksburgh lot as Jacob Ferguson, who was possibly his father, and Farrington, possibly his brother. Religious life was quite ecumenical in those primitive pioneer days. Clergymen were few and were sought by all. Thus a few years after Reverend Robert McDowall “a professor of the Religion of the Reformed Dutch or presbyterian church” had come to that area of Upper Canada, some 70 of the inhabitants of Fredericksburgh and Ernestown-mostly the male heads of families-who “under their present situation do not find themselves able to give him a sufficient support for himself and family” signed petitions requesting that the government grant him land, as their “settled minister.” Arra Ferguson was one of those who signed. In 1792, Arra pledged £3 toward the building of the Hay Bay Methodist Church-no small contribution in a community that lived more on barter than on cash, and from a young man who was only 22, but probably earning money with his pen, drafting deeds. Over 100 years later, he was still remembered by the Van Dusen family in these terms: “The original deed of the land for the site of the [old Adolphustown] church, written in the exquisite penmanship of Arra Ferguson, the conveyancer, is still in existence.” A facsimile copy of it now hangs in the Church. On 7 April 1793 he married Catherine, the orphaned daughter of John Shorts, a Butler’s Ranger who was killed in New York during the War. At a young age she had escaped to Canada with her mother, Rosannah (Monk) Shorts, who died shortly after their arrival. She was brought to Adolphustown in 1784, by her Loyalist uncle, Casper Hoover, who had married Barbara Monk, Rosannah’s sister. By 1806, Arra moved across the water to Hallowell Township, Prince Edward County, and was one of the founders of Hallowell Bridge, now Picton. There, his property included lots 23 and 24 in Concession 3 of the Military Tract (part of which is now Glenwood Cemetery), and an adjoining lot known as Lot A, on which the west end of Picton is built. This latter piece ran north from the ravine, between Cemetery Street and Chapel Street. No doubt he carried on his work as conveyancer-a lot of it done on his own behalf as he became, in effect, a developer, subdividing and selling his land lot by lot. To this day, the street that runs through the centre of what was his land is called Ferguson Street, and nearby is Catherine Street and Mary Street, named for his wife and a daughter. He was chosen Town Clerk of Hallowell four times, serving for 14 years altogether between 1812 and 1831, including his first term, 1812-1815, during the critical war years. Nor was the spiritual side neglected. Amongst the few surviving records of the Methodist church in Picton of that era is a beautifully-written Class Meeting list [copied below] dated 25 August 1816. Arra and his wife, Catherine, are on it along with 47 other members. The first pastor, Darius Dunham, founded the first Class in 1793. It continued over 100 years. 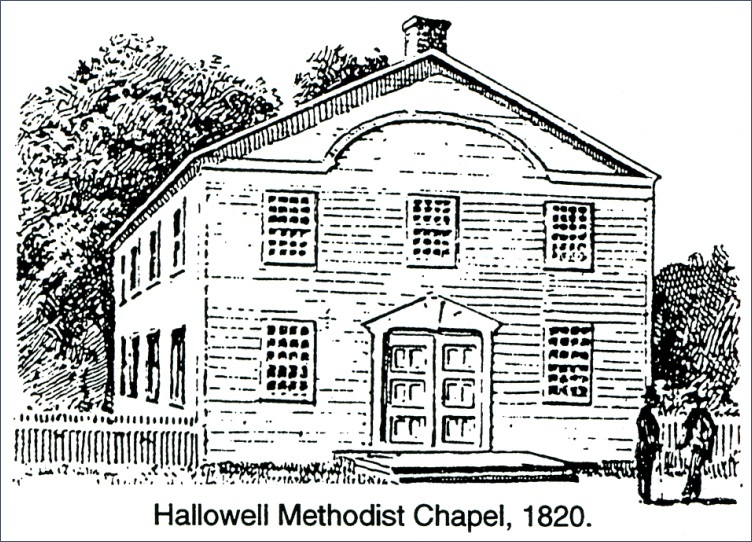 Hallowell Township had its first Methodist chapel in 1809. Called “the White Chapel,” it was built five miles north of the present town on Stephen Conger’s land. But as the new village of “Hallowell Bridge” grew, plans were made to erect a chapel closer at hand. The next day, 2 June 1820, the new deed returned the land to the trustees identifying it as a Methodist place, but with the condition that the trustees “admit and permit all such Protestant ministers and Preachers as shall be regularly authorised” to preach there. Thus, while an effort was still made to assert some restriction with regard to orthodoxy, the offending clause (in italics above) was removed and a more tolerant note injected. The deed was witnessed by Thomas Madden, preacher on the Hallowell Circuit, and Philander Smith his assistant. That year the first Picton chapel was erected. Arra did not live to see the second church, built of stone on the same site in 1854. However, his great-grandson, tinsmith and Picton Town Councillor Isaac N. Waite, was one of those who, in 1898, signed a demand note for $12,000 to enable the construction of the present (and third) stone church, now Picton United Church. Thus Arra Ferguson was involved in the founding of two Methodist chapels. Arra and Catherine had seven children who reached maturity. They were: Patience who married Isaac Waite, Frederica who married John Hare, Mary who married John Coleman, Amelia who married Israel Cook, Richard, Barbara M., who married Conrad Tobey, and Catherine. Richard and Catherine do not appear to have married. No Canadian descendants have been traced, but Amelia, who with her husband moved to Michigan, and, as of 1982, had many descendants still living there, and elsewhere in the USA, including great-great-great-great grandchildren. As he grew older, Arra transferred much of his land to his son, doubtless expecting he would take over. But a great sadness was to befall him at the very end of his life. On the 4th of December 1852, his son Richard made his will; the next month, he was dead. Arra soon followed. He made his will on the 22nd of February 1853, and died on the 28th. her land.” Although this was clearly Arra’s land, “Granny” could not have been the American-born, revolutionary war orphan, gunslinger-pursuing, Catherine Ferguson, his widow, because she died about 1861. It may have been his daughter Catherine. Oral tradition, 60 years later, may have confused the two Catherines. Arra had been generous in volunteering supporting affidavits for the children of old friends when they applied for their land grants as the sons or daughters of UE Loyalists. Two of these have been found, quite by chance, and it was by finding one of these that the author was put on the trail that led to the rediscovery of Arra Ferguson. A note on the pronunciation of his name. His name was certainly not pronounced “Air-uh”, as we would pronounce it today, just from seeing it. The final “a” was, until this century, pronounced “ay”. Thus Canada was “Canaday”-as revealed quite consistently when census takers recorded the Irish name Kennedy as “Canada”, writing down what they thought they had heard the Irishman say. And the initial “A” of Arra was probably pronounced “Ah”-thus “Ah-ray” also sounded like “Ah-ree”-and was, accordingly, sometimes misspelled “Arry”. Dr. Canniff, in one instance, even records it as “Harry”. It was also sometimes recorded as “Orra” or “Ora”, once when probably referring to Arra Ferguson, and once when referring to one of his grandsons, presumably named for him. His name also appears once in Canniff’s work as “Arion” suggesting Canniff thought his name might have been “Aaron.” But Arra himself always referred to and signed himself as simply Arra. Because of the many links with Methodism, more details of Catherine’s family, the Shorts, will interest readers. A British soldier of Swiss origins, John Shorts had served in the Seven Years War (1756-63), and was part of the expedition which captured Fort Frontenac, now Kingston, from the French in 1758. Following his discharge, he settled on the Susquehanna River near the Pennsylvania-New York border. There he married Rosannah Monk in 1764, and five children were subsequently born. At the outbreak of the American Revolution, John Shorts joined Butler’s Rangers. Very shortly thereafter he was taken prisoner by the Rebels and is said to have died in New York City in 1778. When their estate on the Susquehanna was confiscated, Mrs. Shorts and her children, in company with other Loyalists, were piloted through the woods by an Indian to Niagara, which was the headquarters of Butler’s Rangers. Hannah Mary (b. 23 Jan. 1766; d. 26 Oct. 1862) was married on 16 Feb. 1786 to Caspar Vandusen (1761-1838). As Caspar and his brother Conrad were also subscribers of 1792, they will be featured in a future issue of this journal. Catherine (b. 1772; d. 24 April 1861) was married on 7 April 1793 to Arra Ferguson (1769-1858). Frances (b. 1774; d. 10 April 1844) was married in Montreal on 3 June 1792 to Jacob Heck (1769-1847). Jacob was a son of Paul and Barbara Heck (often called “the Mother of Methodism in North America”). For many years he worked as a shoemaker in Quebec City, but in 1807, three years after his mother’s death, he moved to Augusta township and built the large Georgian rubble stone mansion on the shore of the St. Lawrence referred to as “the Heck House.” Frances and Jacob had five daughters, only one of whom married. Philip (b.c. 1775) married Elizabeth Grant (formerly married to Thomas Davis, then to Daniel Fraser), and they had four children. Augustus (b. 17 July 1777; d. 17 Jan. 1862) was married in 1799 to Hannah Prindle (b. 1780; d. ), a sister of Rev. Andrew Prindle, and they had seven children. Augustus was one of the trustees named in the Hay Bay Church Deed of 1811. On 1 July 1817 he was ordained a Deacon in the Hay Bay Church by Bishop Enoch George, and served many years in the continuing Methodist Episcopal Church in Canada. There were several other preachers among their descendants, and a grand-daughter became the wife of Bishop Philander Smith.